Would you be interested in a weekend of drum workshops and drum circles ? 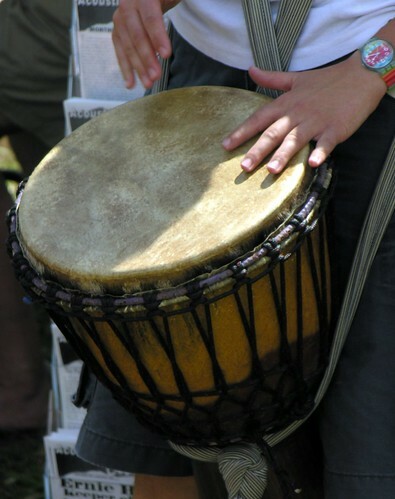 Broward Drum Circle at Fern Forest Nature Center in Coconut Creek – Broward County has some of the best drummers in South Florida, and this is the best place to find them on a Saturday afternoon. The site is sheltered, so the circle rocks even in a downpour. I come up from Miami, and it’s always worth the trip. I plan to be there early to warm up. Oak Grove Park Drum Circle at 159 St & NE 6 Ave in Miami, across the lake from the parking lot & playground. This is a young circle with a distinctly Haitian flavor. There are more good (really good) drummers than there are drums, so bring extras if you have them. There is some seating; but you may want to bring your own. If you want to bring kids, the playground is great (LOTS of kids – all playing very seriously); but it is across the lake from the drum circle, so if you feel that you have to be right next to your kids when they play you may not be comfortable.Also notice th “ish” on the times. I have arrived a couple of time and not heard any drumming; but as soon as I start warming up, a group materializes (as if they were just waiting for me – made me feel quite special). Sunday 3/30 Delou Africa Community Dance Class – 3 PM at FIU Biscayne Campus Academic 2 Bldg, North Miami, FL in the second floor studio Please arrive at 3 PM, ready to start warm up. A suggested donation of $5 will be collected at the beginning of class.No matter what you do, have fun playing in this wonderful weather down here in South Florida! Miami Drums is © Diego Waisman.